Macon County is home to four municipalities. 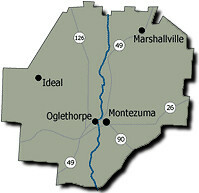 These communities, Montezuma, Oglethorpe (county seat), Marshallville and Ideal, play a vital role in the economic and social fabric of the county. Because municipalities are creatures of the state legislature, their boundaries, their structure and even their existence can be altered or abolished by the state. Georgia law makes no distinction between cities, towns and municipalities. A municipal charter is a written document that provides a municipality with the authority to exist and function. The charter is a city's fundamental law. In this respect it is similar to a national or state constitution. Each municipality in Macon County has a charter that establishes its basic governmental structure, form of government, corporate boundaries, and municipal powers. A city's municipal powers may include, but are not limited to, appropriations and expenditures, contracts, emergencies, environmental protection, nuisance abatement, planning and zoning, police and fire protection, public transportation, sanitation collection and disposal, streets and roads, taxes, and water and sewer services.